A musical tribute to David Bowie, a duet for mezzo soprano and quantum supercomputer, and a showcase of robotics and coastal research will be among the highlights as Plymouth University merges the creative arts and sciences at a major festival this summer. For the second time, Plymouth University is to be the official Creative and Cultural Partner of the Port Eliot Festival, taking place in South East Cornwall from July 28 to 31, 2016. And as part of that, scientists from the University will be taking part in the first ever Port Eliot Science Lab, which will give festival goers the chance to explore science, see performances and take part in a range of experiments. 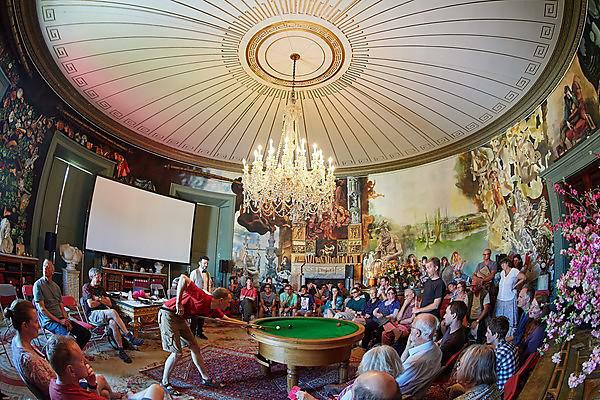 For the duration of the festival, the Round Room at Port Eliot will play host to numerous creative and innovative showcases, led by the University, the Eden Project and the British Science Association. PhD student and British Science Association award-winning lecturer, Hazel Gibson, will explore how we think about the 'land beneath our feet' and discover what happens in the subsurface and how it can affect our lives. Her talk will be titled The Invisible World Below Your Feet: Fracking, Geology and You. As part of the continued partnership between the University and Port Eliot, an increased range of opportunities are being coordinated for both students and the wider community. These will include the opportunity for spatial design students to work with internationally celebrated artist and production designer Michael Howells to create the festival’s iconic Bridge over the Haha. Students will also be working with the team behind Hole&Corner magazine and local businesses to promote knowledge exchange through words, music, comedy and a series of workshops. Port Eliot is the South West’s foremost annual festival of surprises, a free-ranging event which places equal importance on music, words, food, fashion, flowers, walking and water. The 2016 festival will see Noel Fielding and Russell Norman rubbing shoulders with Helen Dunmore, Andrew Weatherall and Ryley Walker on a bill for which ‘more than somewhat eclectic’ would seem to be the most appropriate description.